The 421 polytope has 240 vertices and 6720 edges. There are 240 white dots & white sides of triangles in every 10 overlapping Trees of Life that either belong solely to their outer form or are white centres of 100 of the 140 Type B polygons associated with these Trees that remain centres when the polygons become enfolded (note: centres of hexagons become corners of triangles and centres of decagons become corners of pentagons). Green corners & sides of triangles in every 10 Trees become shared with enfolded polygons, whilst 40 green centres of polygons coincide with corners of other polygons when they all become enfolded. 6720 corners & sides of the 2820 triangles in the 140 separate Type B polygons surround their centres. The five corners & sides on each side pillar of the outer Tree of Life are shared with the two hexagons in the inner Tree of Life because these pillars are their vertical axes. This means that (8n+2) corners & sides in n overlapping Trees are shared with the 2n hexagons in their inner form. Any n overlapping Trees of Life have (12n+4) triangles with (6n+4) corners and (16n+6) sides, i.e., (22n+10) corners & sides. Of these, (8n+2) corners & sides are shared, leaving (14n+8) corners & sides that are unshared. 10 overlapping Trees have 148 corners & sides of 124 triangles that are intrinsic to these Trees. 148 is the number value of Netzach. Every 10 Trees have (14×10=140) corners & sides of 120 triangles that are unshared with the 140 polygons making up their inner form, where 140 is the number of Masloth, the Mundane Chakra of Chokmah. Every 10 Trees have (140+140=280) unshared corners & sides or centres of separate polygons, where 280 is the number value of Sandalphon, the Archangel of Malkuth. Two of the centres of the seven polygons enfolded in each Tree are corners of the latter, so that five centres do not become corners as well when the separate polygons become enfolded. The 70 centres of the 10 sets of seven polygons on either side of 10 Trees consist of 20 centres that become corners and 50 centres that remain just centres. Hence, 100 of the 140 centres of the 140 separate polygons remain just as centres when they are enfolded. 10 overlapping Trees and the 140 separate polygons have (148+100=248) unshared corners & sides belonging to the former or centres of the latter that do not become corners when they are enfolded. For every 10 Trees, there are 140 unshared corners & sides and 100 pure centres, that is, 240 geometrical elements, which either belong solely to the outer form of 10 Trees or are centres of the polygons making up their inner form that remain just centres when they become enfolded. They comprise 120 corners/centres and 120 sides. 3360 corners & sides of triangles surround the centres of the 70 separate polygons on either side of 10 overlapping Trees. So we discover that in every 10 Trees, 6720 corners & sides of 2820 (=10×282) triangles surround the centres of polygons, where 282 is the number value of Aralim, the Order of Angels assigned to Binah. This leaves 240 corners & sides that do not appear among the former when the polygons become enfolded (the centres of the hexagon & decagon in each set of seven polygons become corners of the triangle and pentagon, which are counted amongst the 336 corners & sides that surround the seven centres — hence, they are coloured green to indicate their exclusion from the count). The 240 corners & sides comprise 120 unshared corners & pure centres of polygons and 120 unshared sides of triangles in 10 Trees of Life. Compare the appearance of the numbers 240 and 6720, which measure the numbers of corners & sides in the outer and inner form of every 10 Trees, with the 240 vertices and 6720 edges of the 421 polytope. 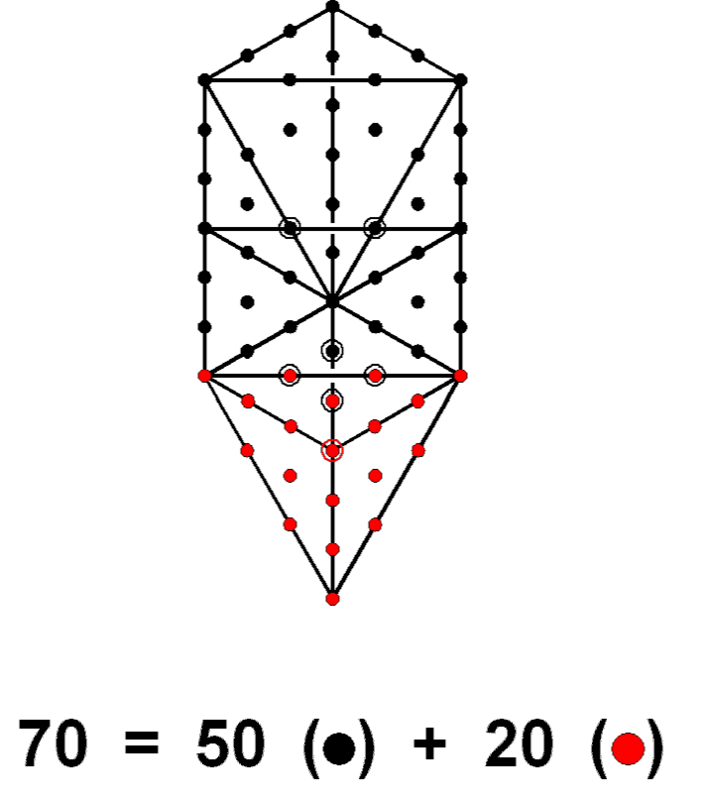 The fact that the latter number manifests in 10 Trees of Life demonstrates the Tree of Life nature of this polytope because this number of Trees represents the 10 Sephiroth of a single Tree. Their counterpart in the UPA are the 240 gauge charges of E8 and the 3360 turns in each revolution of its 10 whorls, each turn being a circularly polarised wave that is a supposition of two perpendicular plane waves with a phase difference of 90°. 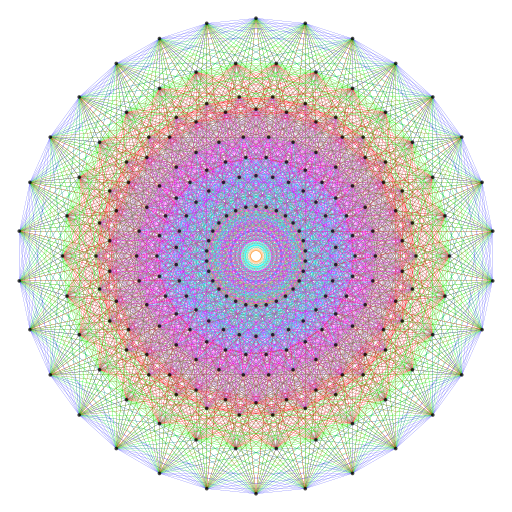 In other words, the 421 polytope represents not only the roots of E8 through its vertices but also the form of the E8×E8 heterotic superstring (UPA) through its 6720 edges, each edge corresponding to a plane wave component of the 3360 circularly polarised waves making up one revolution of its 10 whorls. There is a 20:50 division of the 70 polygons enfolded on either side of the central Pillar of Equilibrium of 10 Trees of Life according to whether their centres become corners (20) or not (50) when they become enfolded. This pattern exists in the distribution of the 70 yods in the 16 tetractyses of the outer Tree of Life into 20 yods that belong to the tetrahedron at its base and 50 yods that make up the remaining 12 tetractyses. This division manifests in the 421 polytope as the 120 vertices and 3360 edges in each half because their counterparts in the outer and inner form of 10 Trees of Life are the 120 unshared corners & pure centres and 120 unshared sides in the outer form of 10 Trees and the 3360 corners & sides that surround the centres of the 70 polygons enfolded on either side of them. Here, once more, is the 120:120 division displayed by holistic systems that embody the number 240. It was discussed in #2 as the compound of two 600-cells, each with 120 vertices, that is the 4-dimensional, Coxeter plane projection of the 421 polytope. The way in which the outer & inner form of 10 Trees of Life represent the 421 polytope was discussed in the section on this polytope in #2.